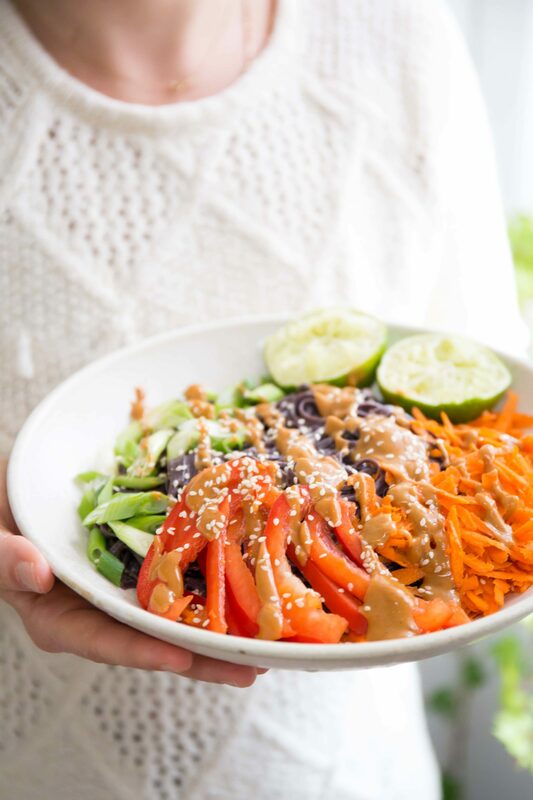 Making your vegetables into noodles is all the rage lately, and while I’ve seen plenty of delicious recipes for them, I haven’t been able to find any that really made the noodles themselves have an amazing taste and – perhaps more importantly – an amazing texture. So I dove deep into the spiralization well (it’s a dizzying place to be). These tips on how to make vegetable noodles work with zucchini, sweet potato, any type of hard interiored squash (ie not spaghetti or pumpkin) – you name it. First up: the spiralizer. There are a ton on the market right now, but I’ve had amazing luck with this guy, which is under $10 on Amazon. I’ve also tried this one with great results. Bottom line: I don’t think you need to spend more than $25 for an awesome spiralizer, and I don’t think you need to buy one of the bigger ones that sits on a countertop (such precious space!!). 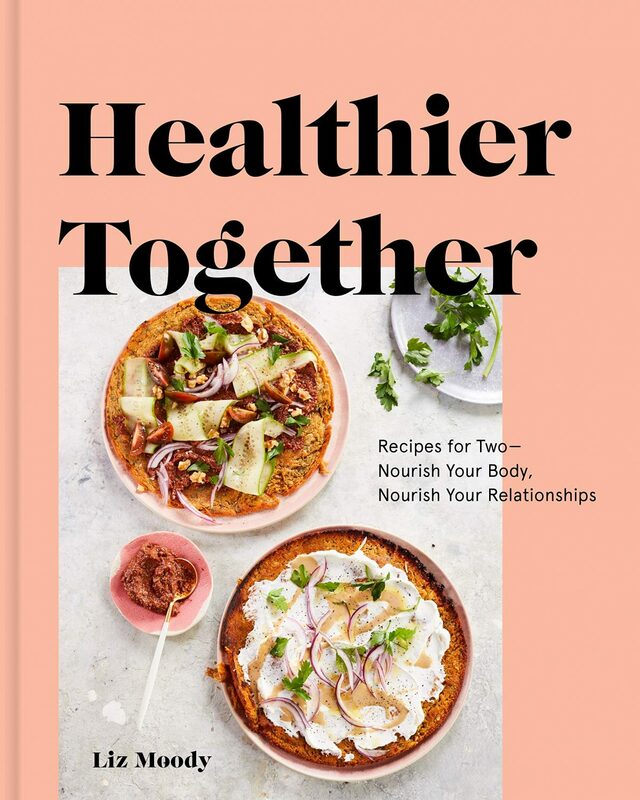 I do think that, while they’re trendy, spiralizers are awesome, worthy investments – they’re a really fun way to include more vegetables in your diet, especially ones you might not typically eat. 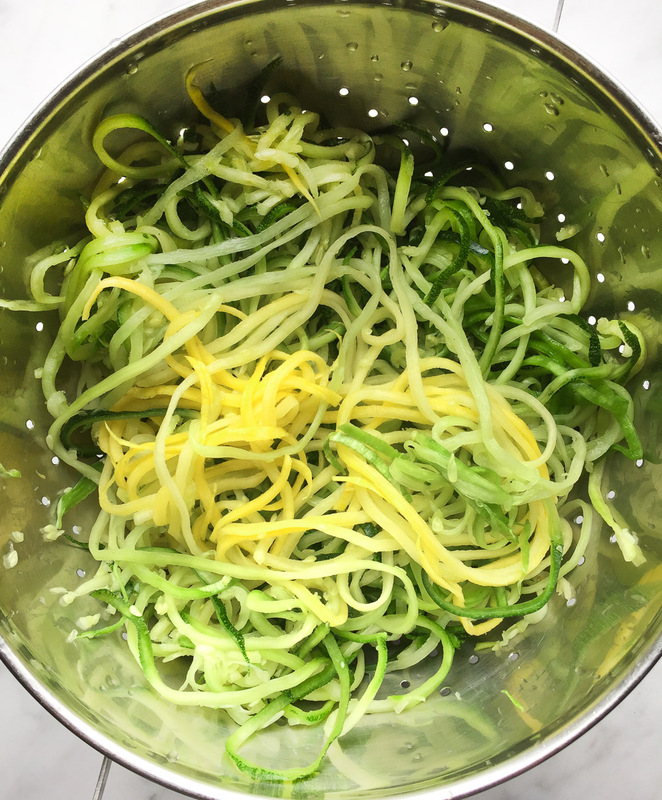 I’m a huge fan of zucchini noodles (or zoodles), even though I typically find the texture of zucchini rather unpalatable, and the flavor fairly bland. If you can afford it, it’s a worthy inclusion in your kitchen collection. If you can’t afford a spiralizer or just don’t want to clutter your kitchen (trust me, I feel ya), you can make thicker, more fettuccine type noodles with a normal vegetable peeler. Just put your vegetable long way down on a cutting board and peel away long thin ribbons. The noodles will be less uniform, but they’ll work just as well. If you have a mandolin, that works great as well – just cut the vegetable into long rectangles before sliding down into thin slices. Zucchini is a great starter vegetable, as it’s texture and shape lets you easily push it through the machine. 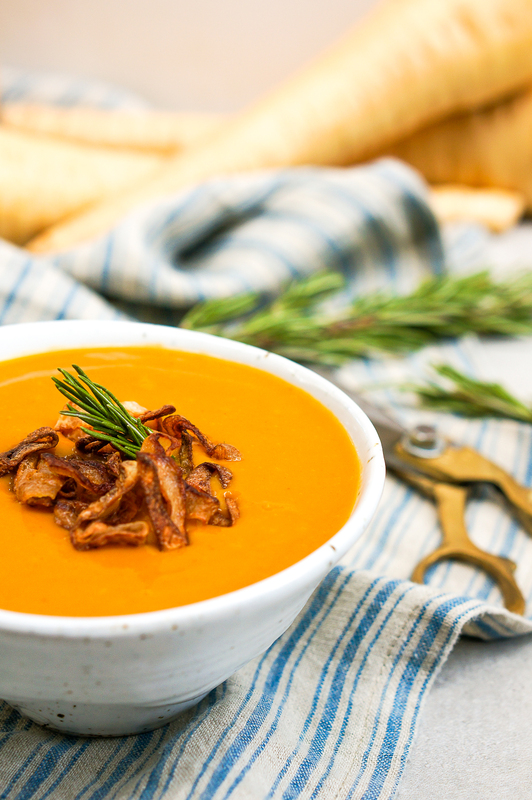 For other squashes, look for something with a long, thin shape (like that of a zucchini), even if you have to cut it to achieve that shape. Because they’re so hard, potatoes and sweet potatoes require a bit more arm muscle. I also recommend cutting them in half the long way (or even in quarters) to allow them to easier go through. When you have your noodles, stick them in a bowl or colander and sprinkle them with fine grain salt. Toss until they’re coated and then put them aside for 30 minutes to 1 hour. The salt draws the liquid out of the vegetables, and getting the liquid out is how you’ll achieve that lovely, noodle type texture (or awesome crispy curly fries), and avoid a soggy, clumpy mess. After 30 min – 1 hour, either press the noodles into a fine mesh strainer or (even better) a nut milk bag. Really try to squeeze out as much water as possible here – if you don’t have a strainer, just wring your noodles out in your hands. Get in there. Squeeze hard. Get your aggression out. Sometimes I’ll even press my noodles with clean dish towels or paper towels to get as much moisture out as possible. Now it’s time to cook! Heat a large saucepan (you want to give your noodles space to breathe) to medium-high, then add some kind of oil (coconut, ghee and avocado all work great) or grassfed butter. Add your noodles and cook, stirring frequently, for 3 – 4 minutes, or until they’re tender but still al dente. Turn the heat off, and toss with your sauce of choice while the noodles are still in the pan, so the sauce really clings to the noodles. 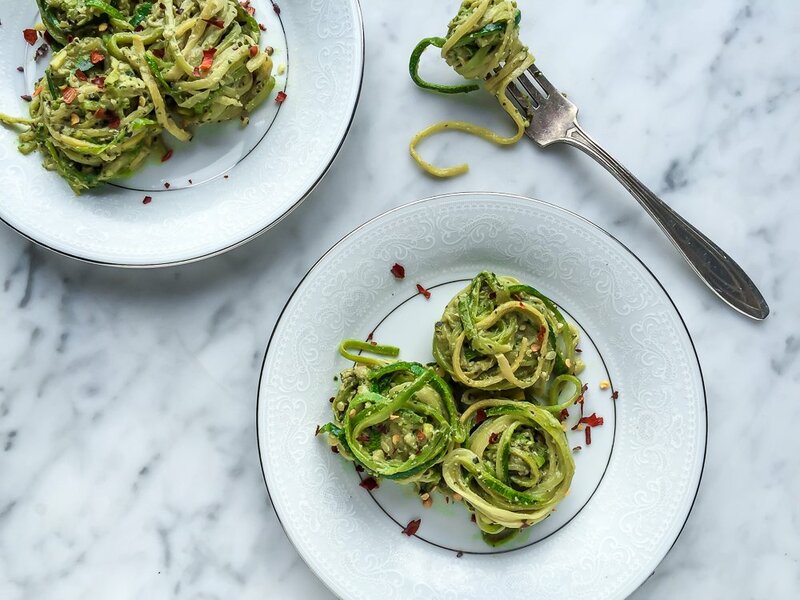 Some sauce / vegetable noodle combos I love are: zucchini noodles with pesto (I particularly love my vegan Cilantro Pistachio Pesto; it’s wonderfully creamy and is a brilliant, beautiful green), sweet potato with Thai peanut sauce, yellow squash with Alfredo. 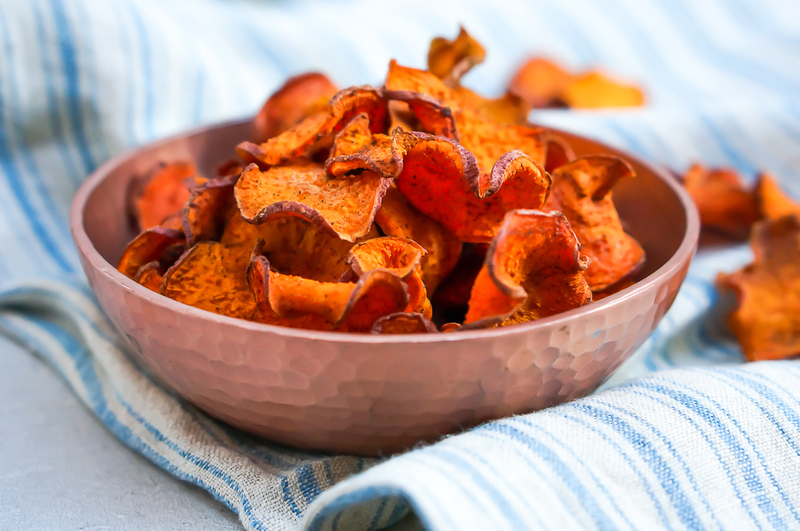 You can also toss sweet potatoes or potatoes with corn starch and some salt, and put them in the oven at 400 degrees until they turn golden brown and then – voila! You have homemade curly fries! 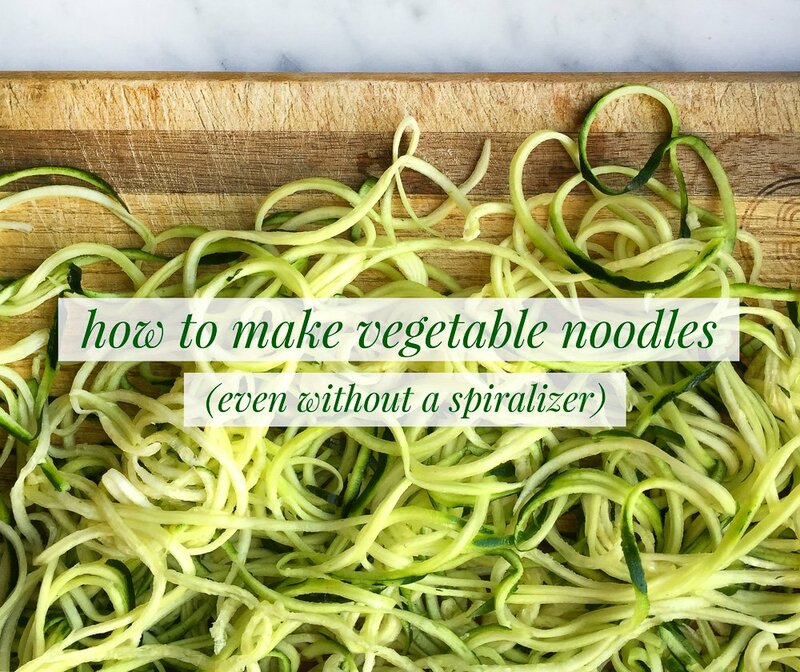 Try making vegetable noodles with these tips, and let me know how it goes! And if you have any other questions, leave ’em in the comments and I’ll do my best to answer.